For some reason, geeks and nerds (like me) seem particularly attracted to running as a sport. Part of the reason may be the immediate data feedback loop. As the film Moneyball exemplified, coaches and managers in many sports place complete faith in the science and utter truth of hard numbers. If only our politicians did the same, perhaps we wouldn’t be heading for the impending sh*tstorm with quite as much haste (I digress). Even average runners like me can gorge on a mass of data extracted from Garmins, Suuntos or other similar gadgets. I confess that I spend an unhealthy amount of time each week looking at the Strava and RunBritainRankings websites. If Strava were the hard drugs of running, then I might be uncomfortably close to being Pete Doherty. I’ve always enjoyed messing around with data, I do it for my day job – playing with information in order to decide whether to it’s a good idea to bet on whether ships will sink, pirates will steal cargo or warehouses will burn down. I stumbled across the RunBritain rankings website about six years ago. For those that don’t know, at its most basic, it records the performances of all athletes in UKA official events (mainly road races, but one or two others seem to sneak in there too). Parkruns are also included. The really clever bit is an algorithm that grades each performance according to the severity of the course and the conditions on the day in order to arrive at a standard scratch measure. From there, each performance can be compared with a theoretical baseline. One’s five best recent performances against standard scratch produce a handicap figure, akin to a golf handicap (0 to 36). Like golf, a scratch or zero handicap would indicate a very high standard, probably in the top 1% in the country. As with golfers, exceptional athletes have a negative handicap. Mo Farah is ranked No.1 in the National handicaps with -7.4. I am ranked 6004th overall in the UK (5779 among males) and 115th in my MV50-55 age group (2.2 handicap). There are just under a quarter of a million athletes on the database. My ambition this year is to break in the top 100. Erm, that’s in my age group, not overall. To make the top 100 overall would require a sub 30 minute 10K time. Aside from measurements of time and comparative performance, I’m also intrigued by physiological data. A couple of years ago, I participated in a study at Leeds Trinity University which aimed to assess the advantage (or not) of drinking beetroot juice before running. As a side benefit from taking part, I was given some physiological data, most interestingly my VO2 max figure, which was 64. VO2 max is a measurement of the maximal oxygen consumption, often viewed as an indicator of endurance capacity. A high VO2 max doesn’t automatically mean that you will be a superior athlete, but I doubt it would do you any harm. Some elite athletes (usually cross country skiers or cyclists) have a VO2 max in the 80s or even low 90s. For example, at the GSK human laboratory a couple of years ago, Chris Froome’s VO2 max was measured at 84.6. On his excellent running blog, http://marathonmanonamission.blogspot.co.uk/, Jason Cherriman always includes a figure for heart beats per mile, which he terms ‘aerobic efficiency’. This is not a widely used metric, but Jason views it as a good measure of fitness. I remember being told at school that fitness is a measure of how quickly one can recover from extreme physical exertion, so perhaps beats per mile does have value. For fun (OK, because I am a total nerd), I have compared my beats per mile figure for this week with Jason’s last week. 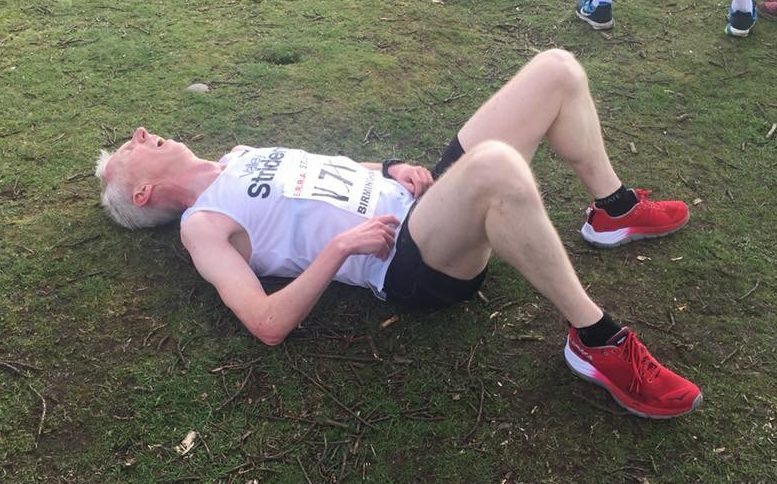 Bear in mind that he is a 2:20 marathon runner in his thirties running 120+ miles per week, I am 2:55 runner in my fifties running around half his volume. Jason’s figure was 978 beats per mile, mine was 1,009. Obviously, he is fitter than me, but there isn’t as big a difference as I thought. A solid week – 71.1 miles logged, which is ahead of my nominal target of 60 miles, but I did naff all last week running wise. My club had one of our semi-regular trips to an away parkrun on Saturday – to Halifax. I ran hard, not totally eyeballs out, but reasonably close to it and I finished fourth in 18:59. It was quite a challenging course, with 272 feet of ascent according to my Garmin. On the back of a higher mileage week and on tired legs, that’s OK.
Today I ticked off pre-London long run number two (of a series of six). It was a very pleasant group run with some teammates around Fewston and Swinsty reservoirs, 21.5 miles of muddy undulating trails in good company completed in 2:47 (7:50 miling – though we did a few miles at much closer to 7 minute miling). Next week will be easier – a few work / life events will prevent me from logging a lot of miles. Hopefully this will act as a mini taper for the Dewsbury 10K next Sunday.